Last week, Brooklyn based artist Michael Mandiberg revealed “Print Wikipedia” - a project that visualizes the complete English Wikipedia through 7,600 printable books. Each book will be uploaded to print-on-demand website lulu.com where it can be ordered for $80. The exhibition “From Aaaaa! 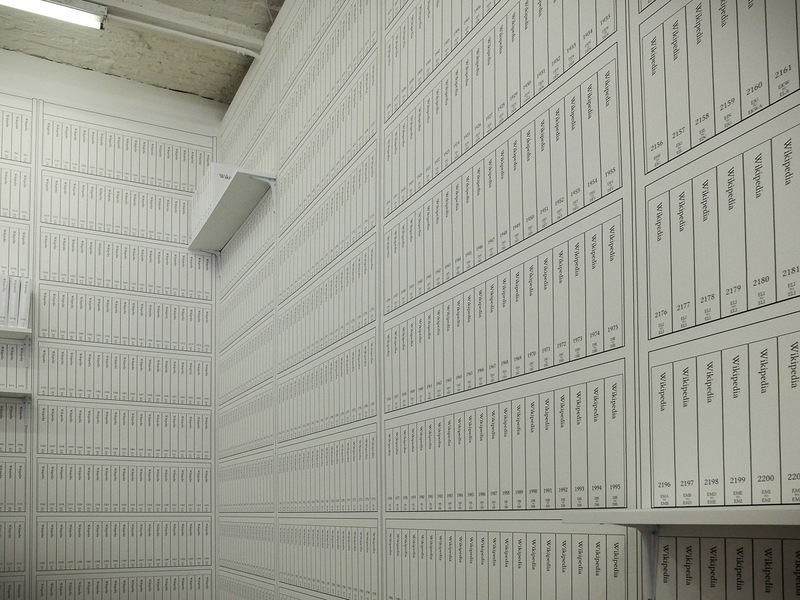 To ZZZap!” at the Denny Gallery in New York documents the upload process and displays 106 physical volumes as well as a wallpaper of the first 1980 volumes. 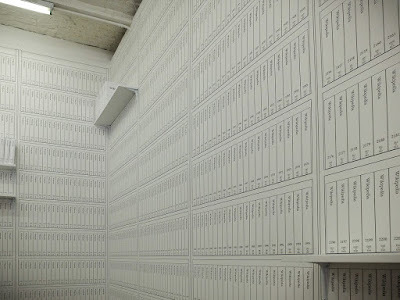 We estimated that printing a complete edition of Wikipedia would not have a big impact on the environment, but Mandiberg’s idea to print a wallpaper of a bookshelf instead of thousands of volumes certainly silences all critics. „Print Wikipedia“ uses mainly the text information from Wikipedia (at least as far as I could see). It does not contain images and tables. This makes book generation easier but leaves out a significant (and important) part of the content. Offering the volumes via print-on-demand allows everybody to experience the size of Wikipedia first-handed and adds credibility to the project. At PediaPress we approached the project differently: with German “Gründlichkeit” (thoroughness) we set out to create a tangible encyclopædia that could be experienced in its entirety by as many people as possible. Of course this lead to much more work (and cost) and after our Indiegogo campaign failed, the project went into deep sleep. My only (small) critique on Mandiberg's effort is that a picture of a bookshelf is not a real bookshelf. To know that there are 7,600 volumes (or 1,200 volumes in our case) is different from taking a volume into your hands, feeling its weight, and flipping through its pages. Unless somebody with very deep pockets comes around and spends $500,000 the project will remain somehow fractioned. Aside from this Michael Mandiberg elegantly created a perfect visualization of the printed Wikipedia. Chapeau, Mr. Mandiberg.